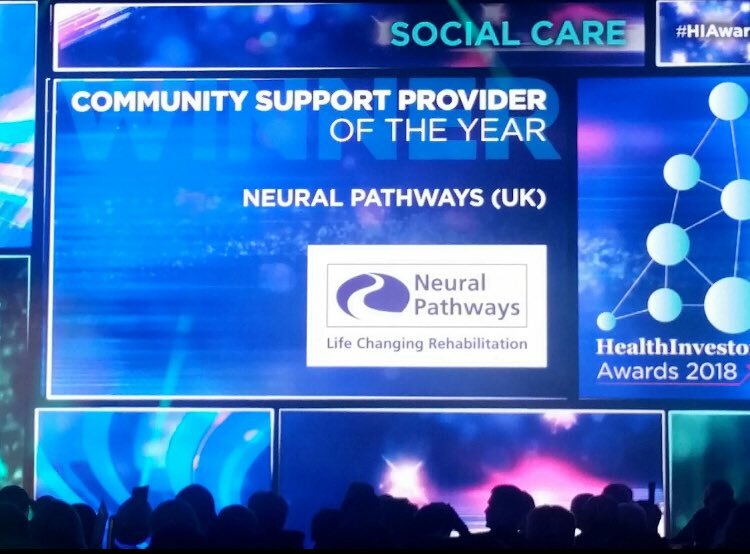 Neural Pathways has WON the Community Support Provider of the Year category in the Health Investors Awards 2018, for a new model of care that we’ve introduced, alongside vital research that we’ve undertaken. Our greatest achievement in 2017 was the development of our Virtual Rehabilitation Beds (VRB)™ model of care. With our partners across the Active Assistance Group, we are now able to offer a high quality, efficient healthcare alternative, enabling highly dependent clients to live well at home. This ground-breaking model wraps specialist care, bespoke rehabilitation and highly skilled Consultants in Rehabilitation Medicine around the person within their own home, changing the landscape of home based neurological care for clients with very high neurological needs. How do Virtual Rehabilitation Beds™ work? All VRBs services provided are built around the clients. We operate a Single Point of Access to the beds and a One-stop Assessment to identify need and build a bespoke combination of team members and intensity of support. Life expectancy is not significantly affected when young people sustain a catastrophic head injury. This means that, without the appropriate rehabilitation intervention, young people face a lifetime of residential care costing the health social care system millions of pounds. Neural Pathway’s long term ambition is to transform the landscape of client-centred home-based rehabilitation for people with the most complex neurological problems. There is an increasing body of research that emphasises the importance of the environment on relearning and neuro-plastic change after any damage to the central nervous system. This means that care and rehabilitation is far better placed in normal environments were real life day to day problems can be solved. Nevertheless, many catastrophically injured clients e.g. those who are ventilated or profoundly physically impaired such as our case study, are often deemed too complex to be managed safely at home and are placed in residential care.